Santa Barbaran Joseph Mastroianni found healing in Bach's Chaconne, both playing it and penning a novel inspired by the musical composition. After Joseph Mastroianni was hit by a car while crossing a New York City street, doctors told him they would have to amputate his leg. Twenty years later, the 64-year-old gets up each morning at dawn to jog along Santa Barbara beaches. "First I used to wheelchair to the beach, and then I crutched to the beach, and when I couldn't do either of those things the doctor rigged me up with a waterproof system for my leg and I did my exercise at the Santa Barbara Racquet Club at their pool," the former pilot said. "Whatever I had to do, I did." Besides the beaches, he credits his remarkable recovery to a mix of his doctors' work, his steadfast determination and the inspiration he found in the hobbies he picked up while bed-ridden -- playing the classical guitar and writing. The culmination of his physical recovery came in 1999. After more than a decade of rehabilitation, with 17 healed fractures and a knee held together by pig ligaments, he rode his bicycle from California to Boston to raise funds for cancer and cardiac research. The fruit of his hobbies came in September with the publication of his first novel, "Chaconne" (Damian Press, $24.95), named after the Johann Sebastian Bach masterpiece that Mr. Mastroianni spent years learning to play on the guitar. For the author, the fact that his book is on the market is less important than the achievements its publication represents. During the 11 years he worked on the novel, he said, he was learning several things from scratch -- how to write, how to play the guitar, and how to walk again. "I've already gotten my reward, because my reward is in the doing," he said. "And now if the book happens to sell, that will be like the cherry on the sundae." The novel is sold at Chaucer's Books in Santa Barbara, where Mr. Mastroianni has lived since the 1970s when he arrived to repair the pilings supporting Stearns Wharf. The book weaves together the lives of Bach, who wrote the Chaconne after his wife's death, and Milo, whose earliest memory is of his absentee father playing the Chaconne. The work is fiction, but Milo's story is heavily autobiographical in parts. The plot follows Milo from childhood through retirement, taking the reader from Massachusetts to Vietnam to Spain as the protagonist goes through rites of passage and adventures similar to Mr. Mastroianni's own. "Nobody writes in a vacuum," the author said. "It's a lot easier to use somebody you know and change their name, because you know how they talk and how they look." He started writing during his recovery, recording thoughts and memories that he never intended to coalesce into a book. "During that time I was just sort of writing therapeutically," he said. "It was just 500 or so pages of scribbling and junk." A friend suggested that he turn his notes into a book. Mr. Mastroianni didn't want to be confined by trying to remember everything exactly as it happened, so he decided to write a novel loosely based on history -- his own and that of Bach. "It frees you to do a lot of interesting things that you can't do when you're writing something that's nonfiction," he said. 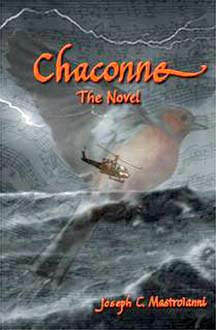 The Chaconne offered a natural structure for the story, given its importance in Mr. Mastroianni's own life. Like Milo, he remembers his father, a professional violinist, playing the piece before he left the family when Mr. Mastroianni was 9. Many years later, he heard the classical guitarist Andrs Segovia perform it. "I was dumbfounded," he said. Mr. Mastroianni decided he had to learn to play it himself. He set off for Spain to spend four years with a teacher there learning the skills to eventually play one of the most difficult pieces in musical history, made more difficult because it was originally written for the violin, not the classical guitar. It would take many years to perfect his technique enough to play the piece all the way through. But when he was hit by a car eight years later, in 1988, he lost everything he learned. In addition to his leg injuries he had several broken fingers, double vision and memory loss. "I couldn't even play a note. I picked up the guitar and couldn't remember anything," he said. But just as he wouldn't cave to his doctors' predictions that he would lose his leg, he didn't let his injuries keep him from the guitar. A friend blew up the Chaconne sheet music to a size he could read, and he started doing exercises on the guitar to retrain his fingers. "Slowly things started coming back to me," he said. "I studied two to three hours every day all through my rehab." It wasn't until two years ago, 15 years after his accident, that he played the entire Chaconne. But Bach's piece -- with its message of pain at the composer's wife's sudden death and resilience to carry on -- guided Mr. Mastroianni through those years of physical therapy as a kind of mental rehabilitation. "I don't think I could have gotten through it without it," he said. "I play it every day at least once. It's like a meditation." Indeed, one of the leitmotifs of the book is the process of dealing with grief and fear through art. Milo, Bach and the author all faced tragedy, and each used the Chaconne to overcome it. Mr. Mastroianni believes in the redemptive power of art so strongly that he's made promoting the arts his pet project. He has planned benefits for various arts organizations in Santa Barbara and Carpinteria, he will donate some of the book's proceeds to libraries, and he works to preserve music and other arts programs in the schools. "Music should be mandatory, just like mathematics," he said. "Believe me, any young child who learns about music automatically starts learning about mathematics. They learn about creativity." In the book's coda Milo listens to the Chaconne and contemplates his life, and the reader can hear the echo of Mr. Mastroianni's voice. For him, Chaconne the musical piece and "Chaconne" the novel are about reflecting on life and coming to grips with what it has wrought. "If you sit and listen to it you will hear the pain and the anger and the turmoil, and then the acceptance that hey, she's not coming back, it's over," Mr. Mastroianni said of Bach's piece. "And then there's the resolution of the acceptance that it's done. It's kind of a microcosm of life. It's everyone's experience, so everyone can relate to it." Who: Johann Sebastian Bach composed the piece. What: The Chaconne, perhaps Bach's most famous work, is a Spanish slow dance in triple meter made up of repeated variations on a musical theme. Why: Scholars say Bach wrote the piece in a fit of grief over his wife's sudden death. Where: He wrote the masterpiece while living in Cothen, Germany. When: Bach lived from 1685-1750 and wrote the Chaconne in 1720.